The use of photons, however, is not without its problems. One major obstacle has been the limited capability of photon detectors to reliably count the number of photons in a light beam. Dmitry Kalashnikov at the A*STAR Data Storage Institute and co-workers have now proposed a scheme to improve the counting precision of photon detectors. The performance of most photon detectors is limited due to the inherent difficulties involved in detecting tiny signals caused by the absorption of single photons. One way to overcome this problem is to use an avalanche photon detector, in which a single photon triggers an amplified number of electrons in the device through the process of avalanche multiplication. Several hundreds of these detectors can be packed into an array to form a multi-photon pixel counter (MPPC) (see image). However, MPPCs also have their limitations. A significant drawback for MPPC is cross-talk. When an MPPC detects a photon, the electrical avalanche is accompanied by the emission of secondary photons, which cause signals in neighboring pixels, says Kalashnikov. In order to filter out this cross-talk, the researchers developed a method to determine the average cross-talk for an MPPC. The average value can then be subtracted from future experiments. Most of the undesired crosstalk can be eliminated in this way, and enables a considerably more precise method of counting photons from quantum sources. MPPCs are widely used in quantum optics, quantum computing and quantum cryptography, says Kalashnikov. 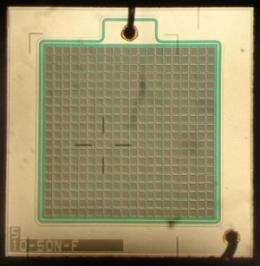 Moreover, they are extensively used in high-energy physics applications, such as the photosensors in scintillator detectors. The new MPPC counting method may be beneficial in a vast number of experiments involving the study of atomicphoton interfaces, as well as innovative applications in astronomy. More information: Kalashnikov, D. A., et al. Accessing photon bunching with a photon number resolving multi-pixel detector. Optics Express 19, 93529362 (2011).